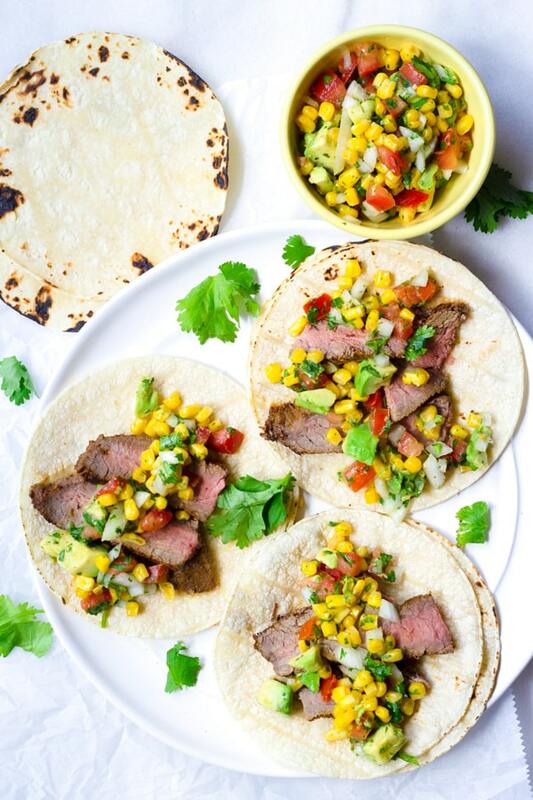 My new favorite: steak tacos with corn salsa! 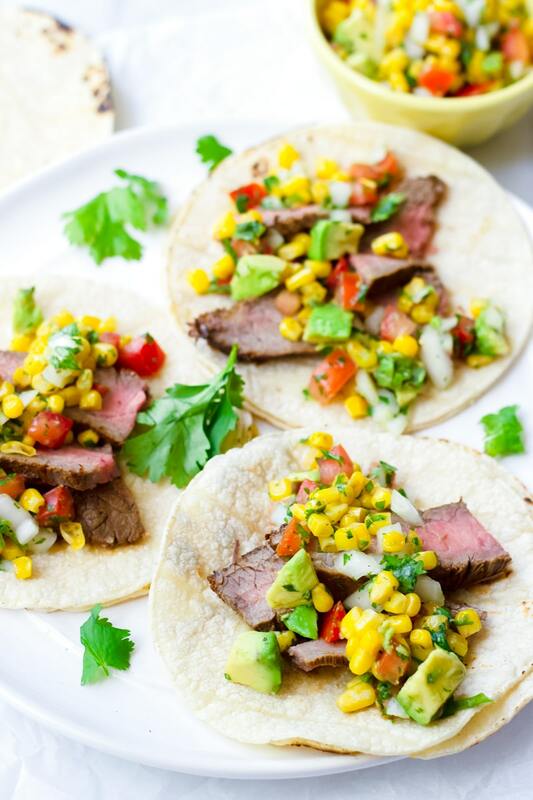 The mojo marinade makes the steak so delicious and tender, and the corn salsa is the perfect topping for these delicious grilled steak tacos. I have a weakness for tacos. Every time I have to decide what to eat, I default to tacos. There are just so many ways to make it, and these mojo marinated steak tacos with corn salsa totally hit the spot. The flank steak is marinated for hours with an out-of-this-world mojo marinade. 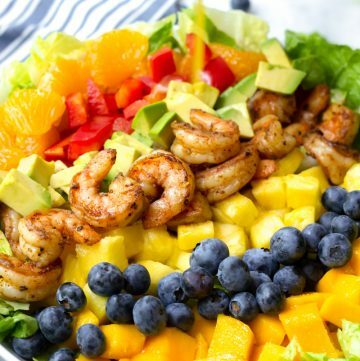 Pass me all the citrus! 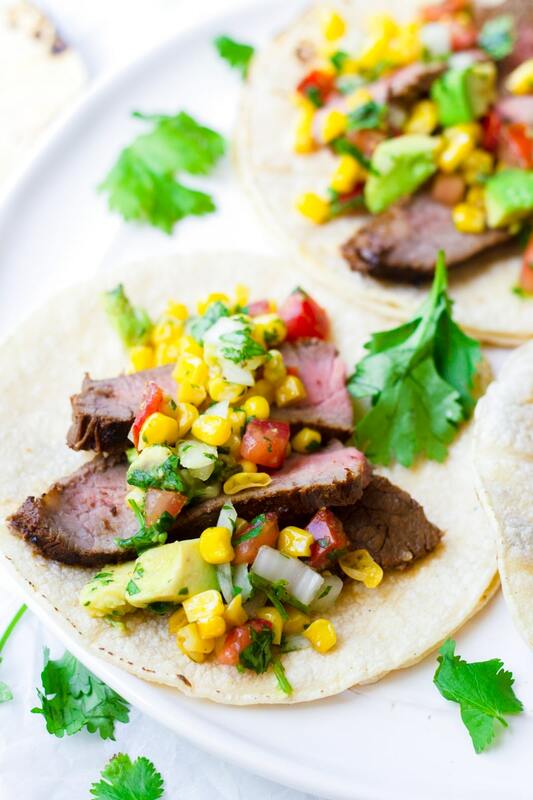 Then these grilled steak tacos are topped with an easy corn salsa. The best thing ever! 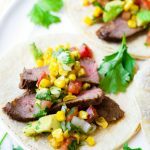 So, let’s talk about how to make a flavorful and tender steak for these amazing corn salsa steak tacos! 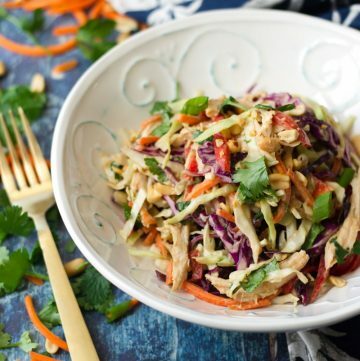 This mojo marinade is like a flavor explosion. So what’s a mojo marinade, you ask? It’s a Cuban marinade, and it’s made with fresh orange and lime juice, minced garlic, cumin, oregano, salt and pepper. Some mojo marinade recipes call for fresh herbs too, especially cilantro. All these flavors provide a great flavor profile for these grilled marinated steak tacos. I mean, you can’t ever have bland tacos! Marinades provide flavor to the outside of the meat. So if you want the marinade to penetrate to the inside of the meat, a quick trick is to prick the meat all over with a fork. Acidic marinades, such as this citrus mojo marinade, can help tenderize meat by breaking down the fibers. However, acid can also toughen meat. The key here is to not overdo it with the acid, and to marinate for only a few hours. 2-3 hours is enough. Anything longer than that will make the meat tough and too sour. Use a Ziploc bag to help the marinade coat the entirety of the meat cut. After marinating the meat for 2-3 hours, it’s all about grilling (indoors or outdoors! ), making the delicious corn salsa, and building the steak tacos on warm tortillas! Marinade the meat in a Ziploc bag for 2-3 hours. If you wanted deeper flavors in the meat, prick the steak all over with a fork. Meanwhile, make the corn salsa. 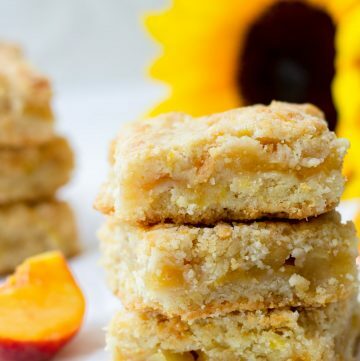 See recipe card. When ready, grill the meat about 4-5 minutes per side for medium rare. You can use an outdoors grill, or do it indoors. I grilled my steak indoors! 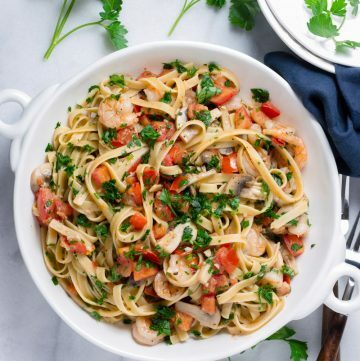 Use a cast iron skillet or an enameled cast iron skillet. Be careful when using a cast iron skillet – it will produce smoke. 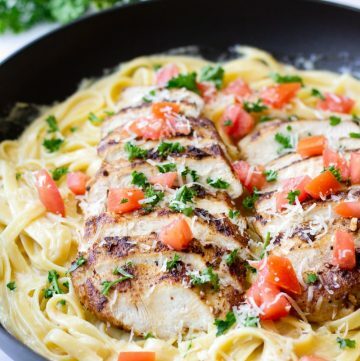 If your kitchen does not have good ventilation, you could use a stainless steel or enameled cast iron skillets, but you may not get as nice of a sear. To minimize smoke, use a high smoke point oil (aka do NOT use olive oil; it smokes quickly). I’d recommend avocado oil or peanut oil, but canola oil works too. Let the meat rest for 10 minutes. Why? It will help redistribute the inside juices. Warm up tortillas directly on the stovetop on open flame. You can also use the microwave, placing moist paper towel in between tortillas. Or just heat them on a skillet. Then thinly slice the meat against the grain (perpendicular to the large fibers). Why? If you don’t you’ll end up with very tough flank steak. Flank steak or skirt steak can be tough, but there are some tricks to get tender flank steak, especially for these delicious grilled steak tacos! Yummy! Use some type of acid, such as citrus, to help break down the fibers. But don’t let it marinate for too long. Acid can make the meat tough if left too long. 2-3 hours should be enough. Do not overcook it. 4-5 minutes for a medium rare. If you really like your steak medium well or well done, I’d recommend a more tender cut of meat instead. But up to you! Let the meat rest for 10 minutes after cooking to allow the juices to redistribute. Cut against the grain, or perpendicular to the direction of the long fibers. 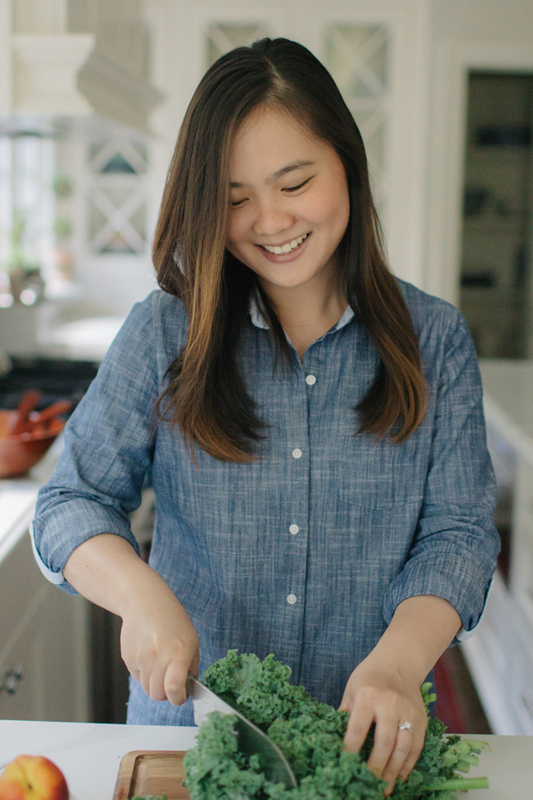 Cut thin slices for a more tender texture. 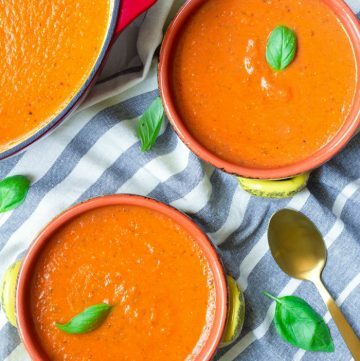 Valentine’s Day is coming up, and this is a great recipe you can make to impress your loved one! Marinate the meat for 2-3 hours, but not much longer than that. Acidic marinades can make the meat too tough if left for too long. Definitely let the meat rest for 10 minutes after cook to allow the juices to redistribute. For tender slices of steak, cut against the grain and cut think slices. For more kitchen tips, see the sections above. Steak Tacos with Corn Salsa for dinner! These tacos are so flavorful. Mojo marinated steak grilled to perfection, and served with a corn and avocado salsa. Prick the meat all over with a fork (this will allow the flavors to penetrate). In a large Ziploc bag, combine all the Mojo marinade ingredients and add the meat. Seal and refrigerate for at least 2 hours, but no more than 3 hours. Prepare the corn salsa: combine all corn salsa ingredients, seasoning with salt and pepper to taste. Set aside or refrigerate until the steak is ready. Heat a grill, or grill pan/cast iron skillet (if doing indoors), and cook meat about 4-5 minutes per side for a medium rare. Transfer steak to a plate and let rest for 10 minutes, loosely covered with foil. Meanwhile, warm the tortillas. If you can, heat on open flame on your stove, which is my favorite method. You can also heat up the tortillas on a skillet or in the microwave. If heating in microwave, place damp paper towels in between tortillas and microwave for about 30-50 seconds. After the steak has rested, thinly slice against the grain (perpendicular to the long fibers). Slicing against the grain and slicing thinly helps to make the steak more tender. 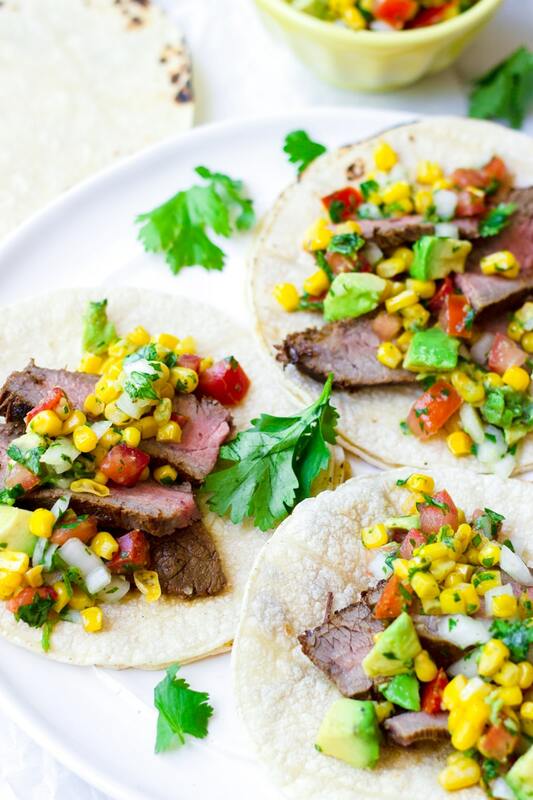 Serve each taco with a few slices of steak and some corn salsa. Enjoy!